Enjoy nature with small boat. 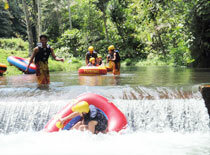 Bali Activity Pakerisan river lies in the southeast peaceful atmosphere of Gianyar, enjoy nature with a small boat, river tubing ! 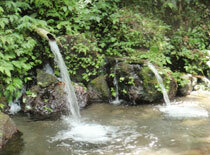 Is packed with attractions of rapids point and waterfalls point, seven holy water spring in the middle of course. "Waterslide" challenge available as many times as to fall about 1 m in front of the end point ! 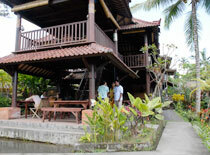 It is recommended for those who want to enjoy nature in Bali from all age range. Child under age 10 has to be with an adult. Please book with 2 persons. Picking up by air-conditioning car Please wait at the lobby. Arriving at the office (same place with a lunch place, "Surya Restaurant"
※Please note that restaurant and mineral waters are not available until back to the restaurant. 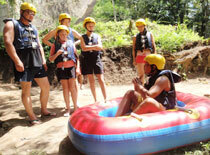 ・Lecture about the course and tubing after putting on a helmet and a life jacket. ・You can leave the valuables in a waterproofed bag each guide carry. ・There is a 1m falling spot called “Water Slider” and you can try it as many as you want! ・You can order beer, large: RP.30,500 and small: Rp.22,500. 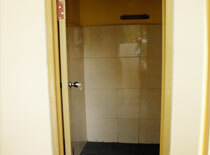 ・You can use a water shower (body soap is not available), a changing room and a rental towel. * Time above is a standard. It might be back and forth. Office surrounded by the nature. Signing the application and paying the fee. Please receive the receipt. You can use the changing room. Make sure go to the restroom before leaving the office. 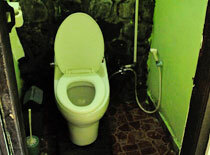 There is no restroom until back to the restaurant. It will take about 10 minutes by car from the office. You will take about 50 steps down to get to the river side. You can leave the valuables in the waterproofed bag each guides carry. There is a short lecture after putting on a helmet and a life jacket. Tubing starts. 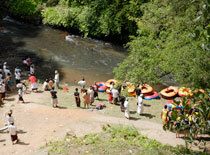 River guides will support safeties at each rapid. 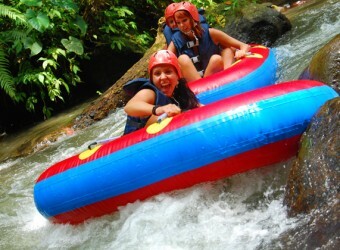 Enjoy waterfalls and holy water points through the activity. You can try “Water Slide” as many as you want. It takes about 10 minutes on foot to get to the car. 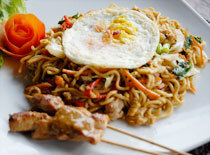 Enjoy Indonesian Lunch Set Including Welcome Drink. What language can river guides speak? Their local river guides can speak Indonesian and English. ※The prices and schedules might change without any notice. ※It does not include equipment insurance. 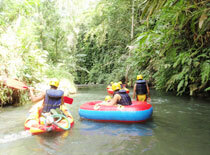 Tropical Bali, I didn’t think that the river has such cold water, it was very cold! Splashing while running fast! It was thrill and exciting.